Directions: Greeter Falls in definitely in the middle of nowhere. About forty minutes away is the town of Manchester, Tennessee (home to the annual Bonnaroo music festival), but that's the only nearby landmark. Follow GPS directions for a pleasant drive through farm country, and you'll get there without a problem. 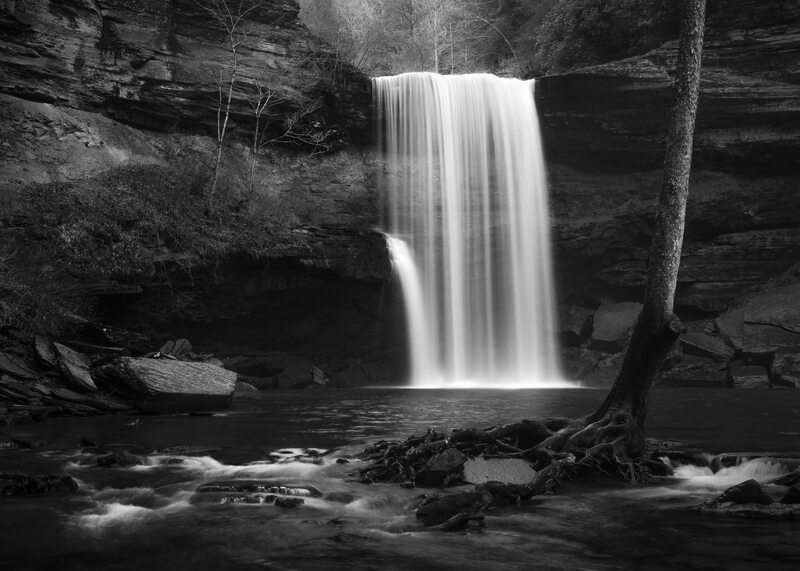 Although it is far from being a popular landscape photography destination, one of my favorite places has always been Greeter Falls in South Cumberland State Park. Only popular during the summer, Greeter Falls is a beautiful location to explore as well as photograph. Depending upon the height of the water, it is possible to walk more than a mile downstream and see the river disappear into a cave in the side of a hill. The rocks beneath Greeter Falls are slippery and uneven, so only carry what you are comfortable carrying while you scramble. No one ever visits Greeter Falls on a cold or rainy day, unless it is a holiday. If you go there during the winter, you may be lucky enough to see fifty-foot tall icicles hanging next to the waterfall. Bring a lens cloth (or several), since the wind tends to blow mist throughout the Greeter Falls valley. A tripod is absolutely necessary, but be careful not to knock it into the river as you’re setting up your camera. When the water level is low enough, you can walk downstream to a group of rocks that let you cross the river. I highly recommend doing so, since the other side of the river has more possibilities for nice photos. If you’re feeling adventurous, consider bringing fishing waders and hiking poles so that you can reach vantage points in middle of the pool near the waterfall’s base. This pool is generally shallow and slow-moving, but note that it can get extremely cold. 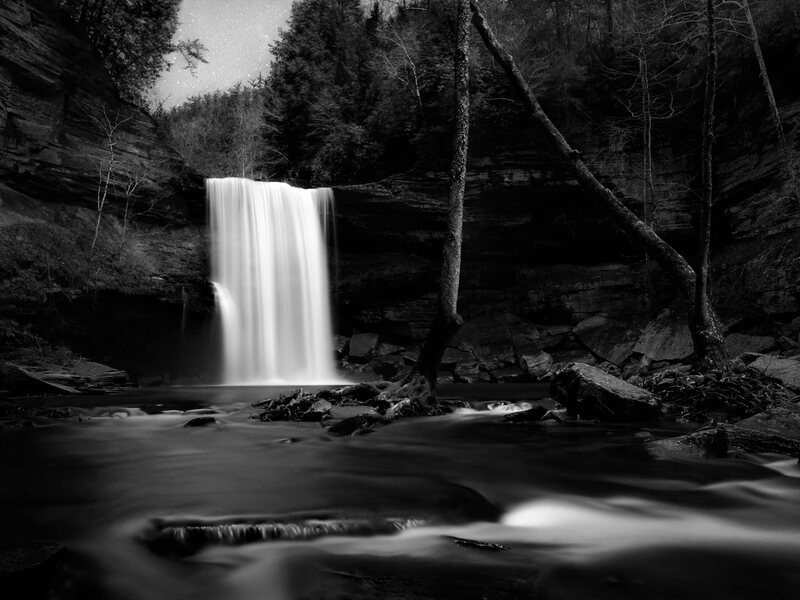 I recommend photographing Greeter Falls with a moderate wide angle lens, anywhere from 20mm to 50mm. Greeter Falls does not catch golden lighting at either sunrise or sunset, meaning that my photos from golden hour are no better than those from an overcast day. The rainier the better — a misty atmosphere adds quite a bit to this already-artistic waterfall. Plus, in the rain, the rocks in the valley become much more photogenic, especially if you are looking for a foreground. To avoid blowing out the sky above Greeter Falls, you may consider bracketing your exposures or using a graduated filter. Using a polarizer will not affect the waterfall itself very much (since the water is moving too dramatically to reflect anything in the first place), but it will cut glare from the rocks in the foreground. 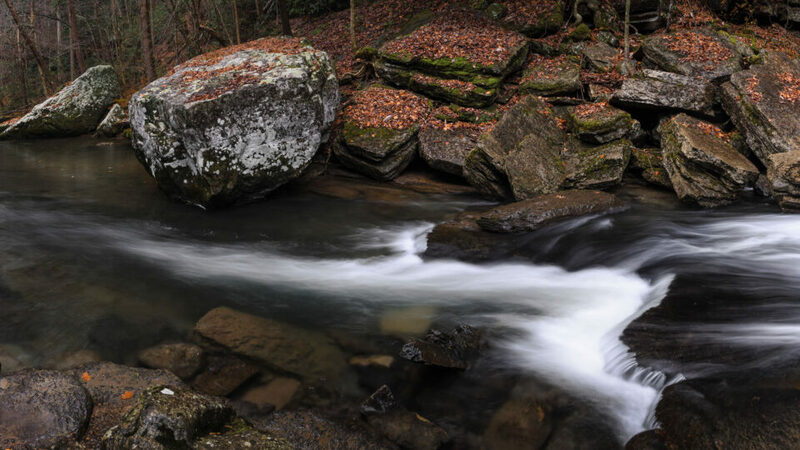 Use an aperture of f/11 or so if you want to get the foreground rocks to be sharp, since they will be significantly closer to your lens than the waterfall. If you are photographing Greeter Falls on an overcast day, it certainly isn’t a rapidly-changing scene. Experiment with panoramas and focus stacking to get the highest-quality image possible, once you have a composition you like.